Migrakare is a dietary supplement developed by neurologists and pain management specialists, that contains clinically effective and natural ingredients for supporting the brain health and function of migraine sufferers. 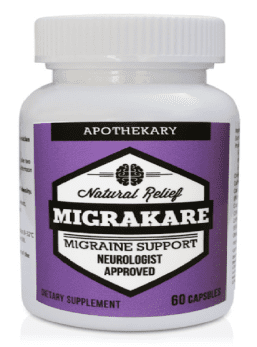 Migrakare contains 150 mg of Butterbur per dose, a botanical ingredient with a long history of helping migraine suffers find relief. Suggested Use: As a dietary supplement take two (2) capsules once daily with food. 2 capsules per day contain Riboflavin (Vitamin B2) 400 mg; Magnesium Oxide 232 mg; Sunflower Seed Lecithin 200 mg; Butterbur Root Extract (Standardized to 15% Petasites) 150 mg. I do feel at the end of the month after taking these, I’ll have a big update.